I was tasting with a client today and noticed that they already had fermenting Sauvignon Blanc samples out on the tasting counter. That’s 2013 Sauvignon Blanc I’m referring to! 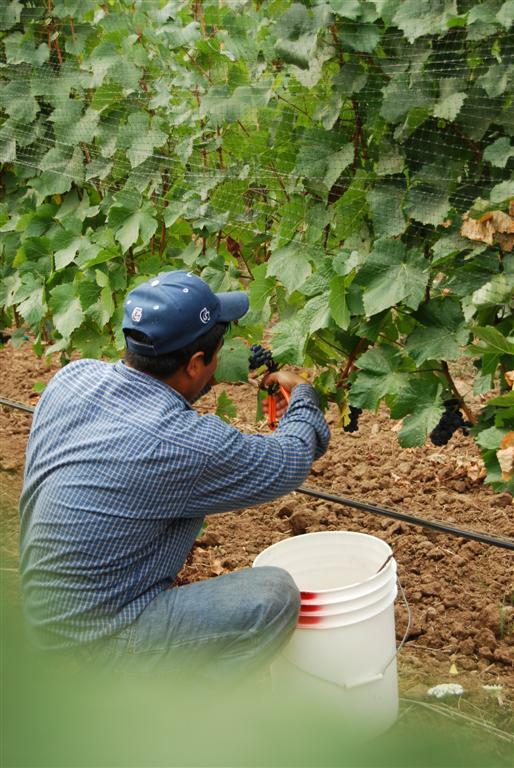 And, the winemaker who handles the reds says they’ll bring in some Pinot Noir next week. All of this reconfirms that harvest is early this year. What does it mean in terms of quality? Who knows? But it reminds me that the #1 topic at harvest time is “hang time.” The term is literal. It refers to the length of time the grapes hang on the vine before they’re harvested. Flowering’s wrapping up here in Napa Valley. See those tiny white, protrusions? They represent the potential crop yield this year for the 2013 vintage. 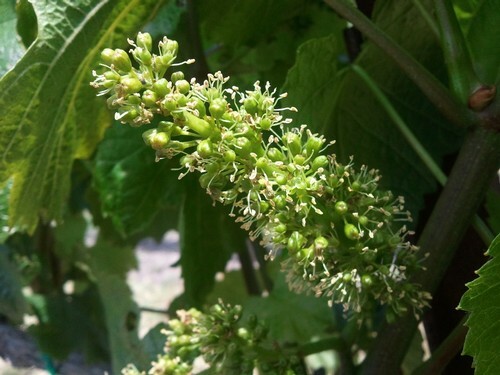 Perhaps you’re underwhelmed by the beauty of the grape flower. True, true – they’re not exactly roses, are they? You have to get up very close to even see or smell them. From a distance they just look kind of fuzzy. Nevertheless, even as we speak the last of the flower petals are shedding their delicate caps to open up, liberating the pollen to fertilize the waiting ovules! Good, gracious me – I think I need a sip of wine! What is bud break? Every spring the tiny buds (growing points) on the vines begin to swell up and tiny bits of pinky-green new growth break through – bud break! I’ve already seen some new growth on some of the early varieties like Pinot Noir and Sauvignon Blanc but the Cabernet vines I’ve seen are still sleeping in. This is a beautiful time of year, here. What’s your favorite time of year to visit wine country? My husband is getting much better. We hope he’ll be moved to a skilled nursing facility this week, to regain his strength. Thank you so much for the kind messages and emails. Send me your wine question I’ll get back to you in a jiffy! Tagged as grape growing, nancy hawks miller, Napa Valley, the tasting group, viticulture, what is bud break? Susan wrote in because she was in Napa Valley last weekend and wondered if we plant all the pretty yellow flowers she saw everywhere, and if they serve a purpose. The mustard season is fleeting! They’re predicting another beautiful weekend here in the Napa Valley, so come on down and take in the view! Cheers! How about a quick, easy and delicious recipe to pair with Cabernet Sauvignon? This one’s courtesy of Chef Michel Cornu of Raymond Vineyards here in the Napa Valley. Bon appetit! That’s what it’s all about, this time of year, and hangtime is an easy one because it’s literal. It refers to the length of time the grapes hang on the vine before they’re harvested. If you’ve grown tomatoes, you know that when the tomatoes first appear on the vine in early summer they’re hard, green and you don’t even think about tasting them because you know that they’re sour. As the summer goes on they plump out, soften up and begin to change color which tells you the sugar is on its way up and the tart acid on the way down. Well, it’s just the same with grapes. The best winemakers want the grapes at peak maturity, just like a great chef needs to buy the best meat and produce. There’s only so much you can do with average-quality ingredients in a restaurant or a winery. This is where hangtime really comes into play. In our warm climate here in the Napa Valley, the sugar builds quite readily and the acid softens quickly too. Since the sugar provides the alcohol and alcohol gives wine much of its body, it’s important to pick at the right moment. But, is the flavor development in line with the increase in sugar? Not always, in a warm climate. Sometimes the sugar reading (brix) screams “PICK ME!” at the winemaker, but the flavors haven’t quite turned the corner. Aren’t the purty? There’s something so sweet and lovely about the clusters as they begin to blush and change color. By the time they’re finished they’ll be almost black in color. And, the color change is such a significant event that there’s a name for it – French, of course 😉 – veraison. 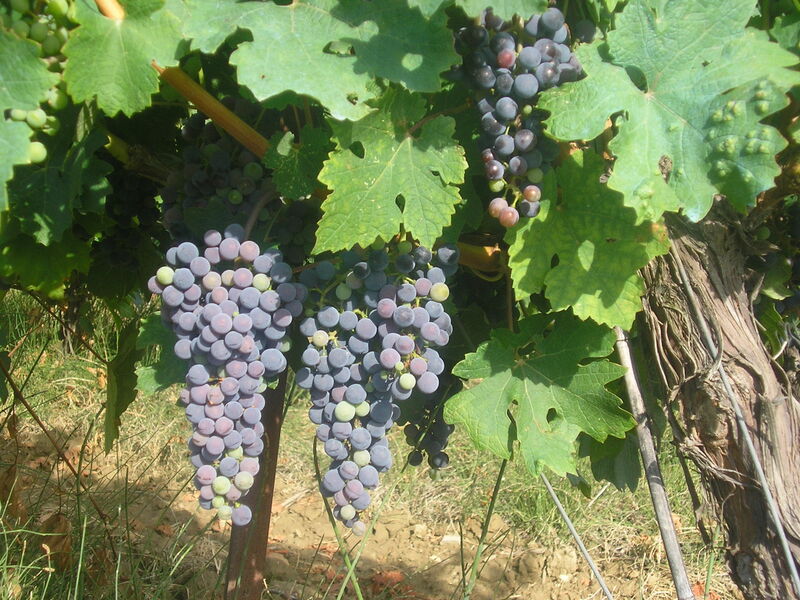 Veraison signals that the shoots have stopped growing and that the vine’s energy has shifted into fruit ripening. It’s a kind of code language to the vineyard manager and the cellar master to get it together for crush because the grapes will be pounding on the door before long.